If you're ever passing through the leafy town of Sint-Genesius-Rode near Brussels, and you see a thoughtful man walking a dog, you could be witnessing the birth of a poem. The man could be the President of the European Council, Herman Van Rompuy, the dog Louis, a 10-year-old mongrel from a rescue centre. And the poem? One of the 17-syllable haiku that have earned Mr Van Rompuy the nickname Haiku Herman. Haiku traditionally evoke an experience of the natural world, and a walk with Louis - in the woods or fields near his home - provides Mr Van Rompuy with subject matter morning and evening. steam in the winter air. When Mr Van Rompuy unexpectedly pipped Tony Blair and others to the European presidency last year, he had been Belgian prime minister for less than a year. Outside Belgium itself, few knew much about him. It was fertile ground for myths to arise, and one of these - that he composes haiku during political meetings - Mr Van Rompuy is keen to kill off. If the moment of inspiration comes while out with Louis, the process of composition takes place overnight. "I write haiku in the evening, just before sleeping, and I wake up with the poem of the day before," Mr Van Rompuy says. "In my sub-conscious lots of things are working." He was bitten by the haiku habit in the early Noughties, through a friendship with the man known as Flanders' Father of Haiku - an elderly priest, Bart Mesotten - who gave him one of his books. Mr Van Rompuy "fell in love" with the miniature verses and, with Mr Mesotten's encouragement, started writing them too. The haiku are also published on Mr Van Rompuy's website. The latest example published there, titled Corvara, illustrates another traditional feature of haiku - an element of surprise in the ending. The poem evokes the "happy and strange experience", as Mr Van Rompuy describes it, of visiting the same ski resort in the Dolomites year after year. "We go to Corvara since 1993. The same people, the same slopes and of course, the same mountains, and it's as if these mountains are waiting for you, and it's an annual rendezvous - they are still there. "I have changed, I have different functions, and in my life so many things happen during the year, but they are still there, waiting for us," Mr Van Rompuy says. Belgian newspapers delighted in the fact that in 2008, just after he became prime minister, Mr Van Rompuy and his wife travelled to Corvara in their usual way, by overnight coach. This year, finally, tired out by the pressures of high office, they flew. The website also features haiku composed in Australia last summer, during a holiday in a camper van - another trip the Belgian media considered absurdly low key for a head of government. But razzmatazz is not really his thing. Mr Van Rompuy has written that haiku represent for him the "unattainable ideal of simplicity" and "an aversion to the sophisticated and over-competitive world". "It's a very sober form of poetry and because I am some kind of sober-minded personality, I like it. It fits with my personality," he says. A devout Catholic, he goes on regular retreats at Affligem Abbey. He didn't campaign for the job of EU president, and until the Belgian king talked him into becoming PM, he appeared to be drifting towards a comfortable retirement dominated by books, religion, country walks and family life. 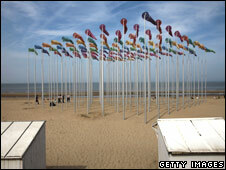 The family's under-used cottage at De Haan, on the North Sea coast near Ostende, beckoned. Haiku featuring gulls and waves seemed sure to follow. Anyone who attempts to read his personality from his poetry, will wonder whether he might have preferred this quiet life to the job he has ended up in. But he says this not the case. "Every man has at least a double nature," he replies. I even maybe love crisis. "But another part of my nature likes authenticity, family life, nature." 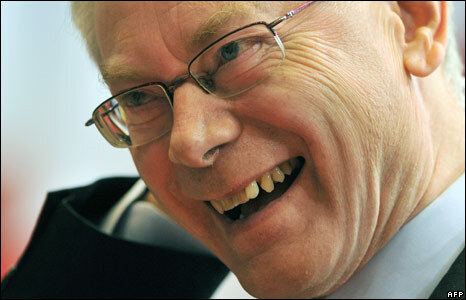 Mr Van Rompuy denies any artistic ambitions, or any deep knowledge of the Japanese haiku masters. OMG! I love this guy! He takes his hobby less seriously than another poetically inclined former Belgian prime minister, Mark Eyskens, and considerably less seriously than the ultra-highbrow former French PM, Dominique de Villepin, author of numerous volumes of poetry. But at the same time, his haiku are more than just fun, he says. On this point, he and his four twenty-something children differ. "We don't take it seriously at all. For us, most of his haiku are very funny," says Peter, the eldest, international secretary for the Christian Democratic and Flemish Party, to which his father also belongs. "It's just an element of fun at the dining table on Sundays." There is one, though, that they really like, he adds - a tribute to their mother, which hangs in the living room of the family home. I look around the house. None of it came about because of me. Asking a professional British poet to judge the work of an amateur who writes in Dutch is possibly unfair, but the former poet laureate Andrew Motion, in the Guardian , found good things to say about two Van Rompuy poems. Fiona Sampson, poet and editor of Poetry Review, says reading Mr Van Rompuy's haiku is like looking at "someone's holiday snaps". Doves scatter from the corn. Mr Van Rompuy's fellow amateur haiku writers (in the West it's not a form favoured by professionals) tend to be more enthusiastic in their praise. "OMG! I love this guy!" writes Alison Kehler at haikubytwo.com. and correct me if that's not a great quality for leadership!" Bart Mesotten, Flanders' Father of Haiku, says Mr Van Rompuy is "not a real poet, but he loves haiku, and he writes very good haiku". Thanks to him, Mr Mesotten says, at least everyone in Belgium has now learned what haiku is. Translations mostly by Wietske Burema.